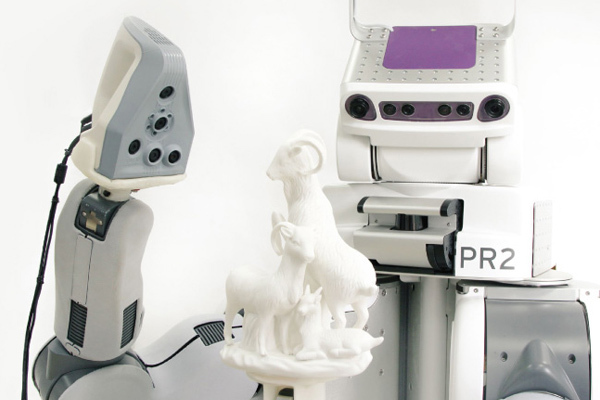 A 3D scanner transforms an object from the physical world (left) to 3D digital form (right). Software: 3D scanning software that powers the scanner. The software acts as the control center that runs the entire operation, from capturing 3D data from the physical object to cleaning up the output, the 3D model. The model contains valuable information such as measurements, surface characteristics, and geometry information about the physical object. They are useful for applications such as reverse engineering, product inspection, computer graphics for creating CGI in gaming and movies, or 3D visualization for the purpose of viewing. To begin the scanning process, the capturing unit projects a series of reference patterns onto the part’s surface. The light source projects a series of patterns onto the object, usually in the form of multiple parallel beams. The patterns become distorted when projected onto the object’s surface. The scanner captures these images using the cameras. The cameras relay the images back to the 3D scanning software. It uses these images and the software’s algorithms, using the method of triangulation, to calculate the object’s depth and surface information. The final output from the 3D scanner is a digital 3D representation on the computer in the form of a 3D scan. 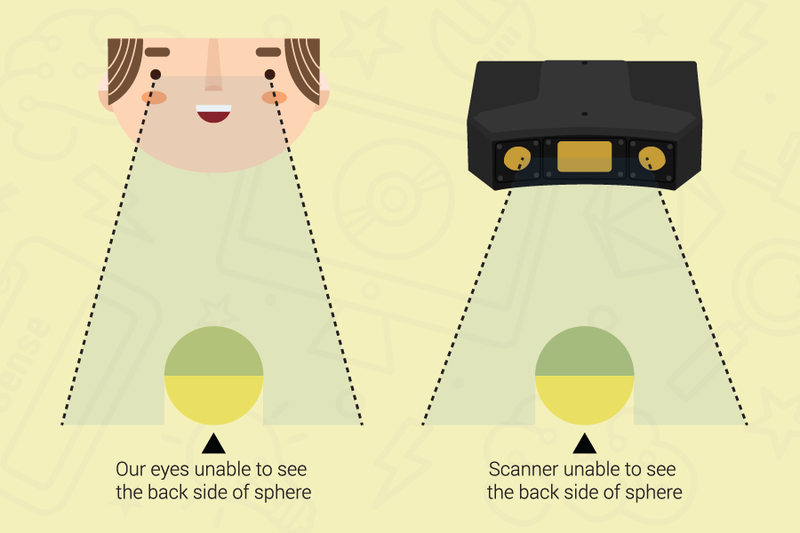 A structured-light 3D scanner can only take 3D images of what the cameras can see. Therefore, in order to create a digital model of the entire object, scans have to be taken at multiple angles. The scans are then cleaned up, merged, and stitched together (known as post-processing) in order to create a complete digital model. Structured-light 3D scanners can come in the form of a stationary 3D scanner or handheld 3D scanner. Stationary 3D scanners require the capturing unit to be mounted on a stable surface. 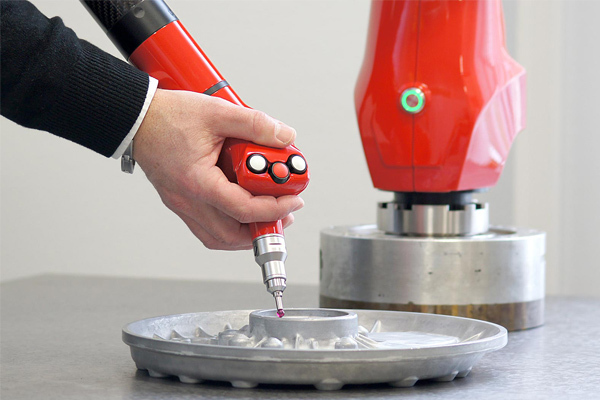 If you want to speed up the scanning process, an automated rotary turntable can be added to automate the 3D scanning process so the user doesn’t have to manually turn the object to scan the object from all sides. Compared to a stationary 3D scanner, the handheld 3D scanner is more portable. It works similar to a video camera. The user holds onto the capturing unit while collecting data from the physical object. To better understand the differences between a stationary 3D scanner compared to a handheld 3D scanner, make sure to check out our post on Choosing Between a Stationary or Handheld 3D Scanner. If the structured-light scanner uses color camera(s) instead of ones that only capture black and white images, it will be able to capture color and texture of that object as well. For many applications, capturing color is not overly important if you just need the digital models for measurement purposes, as in the case of computer-aided inspection. Color is important for applications where you want to accurately represent the object in 3D digital form as in the case for selling products on an ecommerce website, creating graphic imaging for gaming or movies, or for digitizing artifacts for viewing, documentation, and sharing. If you are on a tight budget and color isn’t essential, you can typically save money by getting a 3D scanner that captures monochrome 3D models instead of color. Is a Structured-light 3D Scanner Right For Me? The main advantages to using a structured-light 3D scanner are it can capture objects into complete digital 3D models with full detail at very fast speed. A 3D scan can be captured in about 1 second, while a full 3D model of a basic object can be captured in just a few minutes in high-resolution (million(s) of polygons) with extreme accuracy (sub-micron). Due to its fast scanning speed, structured-light 3D scanners are especially great for projects where you have to scan objects in volume or if you have to scan people. People have a tendency to move due to breathing so the faster a scanner can capture a scan, the better the scan results will be. Structured-light 3D scanners are great for capturing objects in full digital 3D model from approximately 1 cm to 3 meters in size. Structured-light 3D scanners are useful for a range of industry applications. Read our industry applications guide to learn more about the different uses. The best way to determine if a structured-light 3D scanner is right for you is to consult a reputable 3D scanner provider who can answer any of the questions you have. They will be able to assess your application and determine which scanner is most suitable for your needs. They can also give you use cases similar to your application to demonstrate the capabilities of the scanner or provide test scans for you. This will ensure you get what you need upon purchase.